(Newser) – It may not be real, but it sure is a great yarn. And if by chance it is real, it could make you rich. 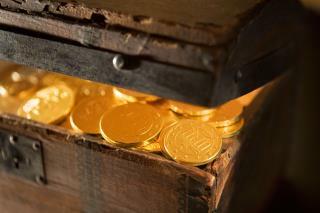 Lucas Reilly at Mental Floss digs into the legend of Thomas Beale's buried fortune in Virginia's Bedford County. The short version: Beale was a 19th-century adventurer who supposedly buried gold, silver, and jewels—worth an estimated $60 million today—in a secret location within four miles of a tavern in what is now Montvale, Virginia. Beale then left a lockbox with a hotel owner in case he never returned. He never did come back, and the lockbox contained three ciphers that, if cracked, will supposedly lead the lucky puzzle-solver to the location of his treasure. So far, only the second cipher has been solved, one that is said to describe the contents of the treasure. What is this? Like the Movie:National Treasure-2004 this is one good movie with Nick in it. A historian races to find the legendary Templar Treasure before a team of mercenaries. https://www.imdb.com/title/tt0368891/ Gear History lessons in this movie too! People don't bury Gold--they spend it.